A cold soup is the perfect appetizer for a summer BBQ and this one is particularly refreshing, as the crushed caraway seeds and the dill give it that special zing. Since this is the beginning of the growing season, it’s a perfect time to use the locally grown garden cucumbers instead of the all-year-around English cucumbers which have little flavour in comparison to the garden cucumber. If you can’t find the local garden cucumber you can of course use the English cucumbers. This easy recipe is adapted from a Williams-Sonoma recipe. The only special equipment you will need for this recipe is a blender to purée all of the ingredients. This refreshing chilled soup can be prepared in advance up to 12 hours before you serve it, which makes for an easy appetizer to serve when entertaining a group of friends for a BBQ. After peeling, halving lengthwise and taking it out the seeds of 3 cucumbers, chop the cucumber halves coarsely. Transfer the cucumber halves into a large bowl and combine with the yogurt, lemon juice, green onions, dill, garlic, caraway seeds, salt and white pepper. Cover bowl with plastic wrap and set aside a room temperature for about an hour. In the meantime you can peel, half and seed the 4th cucumber and then dice this last remaining cucumber into small ½ inch cubes. Set aside until ready to serve. 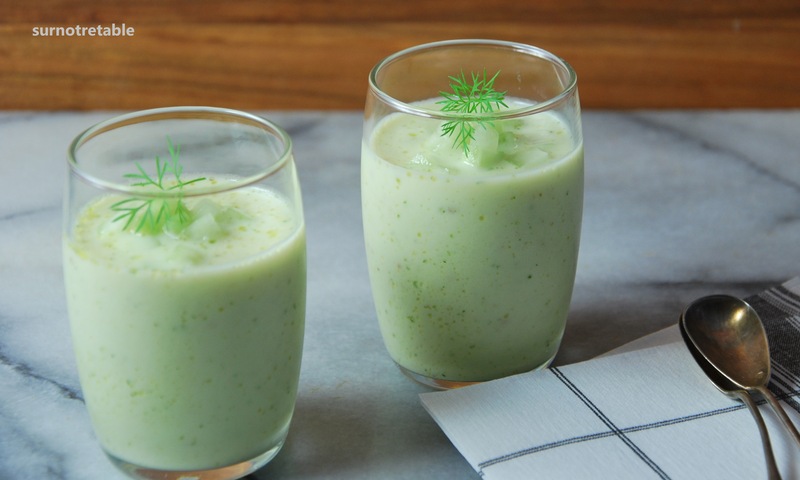 Once the flavours of the cucumber and the other ingredients have combined you can pour into a blender and purée until smooth. Then slowly add the vegetable stock and continue to purée until it is fully blended, for about 30 seconds. Transfer soup into a pitcher and cover with plastic wrap and chill in refrigerator for about 2 hours. You can actually make this soup about 12 hours in advance as it can be stored in an airtight container in the refrigerator until your are ready to serve it. When ready to serve the soup, mix in the olive oil into the soup and serve in small bowls or as we did in verrines. Then just add cubed cucumber to each bowl, top with a sprig of dill and serve immediately. 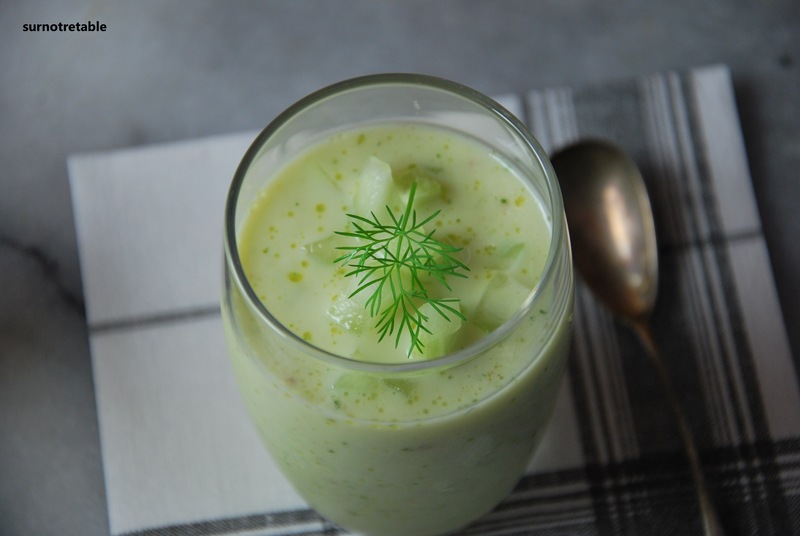 This entry was posted in Appetizer, Easy, Make ahead, Soups, Vegetarian and tagged appetizer, caraway seeds, chilled soup, cucumber, dill, easy, fast, make ahead, make in advance, soup, vegetarian by Caroline Reny. Bookmark the permalink.